Starting with the shampoo bars. I have previously tried shampoo bars from Lush and I adore them. They last me forever, longer than a bottle of shampoo and I just love that they're all natural ingredients. This time I decided to pick up the Jason and the Argon Oil Shampoo Bar after giving it a quick sniff. Before this shampoo bar my favourite was always Godiva, I adored it (still do!) and thought nothing would compare but then this graced my life (dramatic but true!). Packed with Argon Oil and scents such as Rose Absolute and Sicilian Lemon Oil it not only leaves your hair looking and feeling fab but it also leaves your hair smelling absolutely amazing. I definitely have a few more uses in this and I can see myself re-purchasing it the next time I'm in a Lush store. I don't remember the exact price of this as I bought it back in January, but it is near enough around the €9.50 price range. 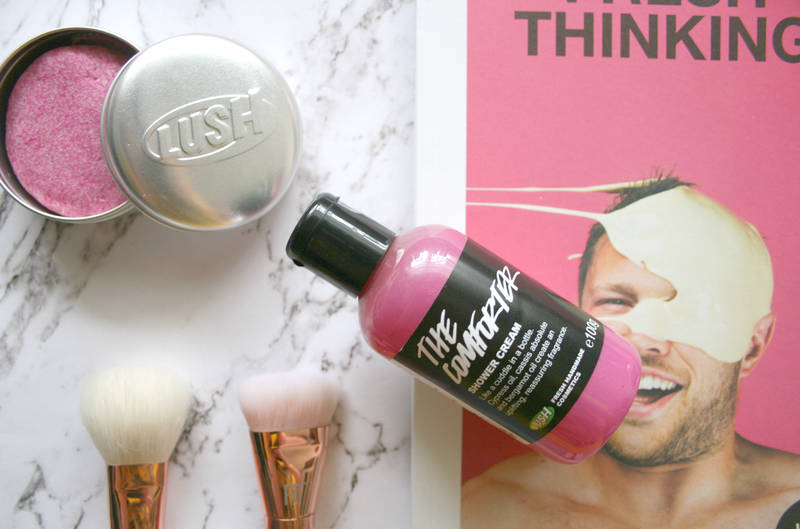 Onto my most favourite product I've ever tried from Lush, The Comforter Shower Cream! I've featured this on my blog before telling you all how much I love it but I'm going to tell you all again. It's the best smelling thing I've ever smelt and when I use it the scent lingers so much that you're able to smell it throughout the whole house. With scents of sweet cassis absolute, bergamot and assuring cypress essential oils it's one of those things that instantly lifts your mood. It's so sweet and girly and I just cannot get enough of it. I only bought the 100g bottle (which is around the €7 mark) and I could kick myself for doing so. I need a huge bottle of this in my life because I only have enough for one more use and it's killing me to know that when I use it then it's gone! This is something I may just order online and pay the ridiculous p&p fee because it's just that good! If you have yet to try either Lush product please hop, skip or jump down to your local store and sniff away, trust me you will not regret it. I really want to try The Comforter shower cream, I love Snow Fairy and Lush shower products always leave such a nice smell too! I still haven't tried The Comforter! I picked up some bath bombs from their Easter range yesterday that I'm so excited to try! I adore The Comforter! I´m so glad they have a shower gel version of it as my parents just got rid of their bath tub! The sent is my favourite of all time and yes, the whole house smells of it. I love it to pieces! !